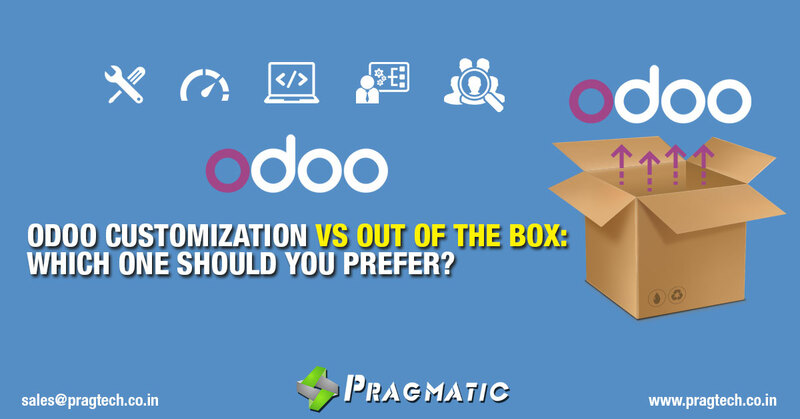 Odoo Customization Vs Out of the Box: Which One Should you Prefer? When it comes to implementing bigger business management solutions like Odoo ERP (Enterprise Resource Planning), asking whether you should go for Odoo out-of-the-box or Odoo customization is not really the right question. The question to be asked is what type of business processes do you have? It’s more likely that some of your business processes are fairly standard and can be handled very well by Odoo out-of-the-box software. And it is also likely that you have a unique value to your business that may benefit from a Odoo customization approach. Instead of thinking in black and white, it’s better to think about finding the most cost-effective combination for your business—one that has exactly the features and functions you need at a price that fits your budget. First, let’s talk definitions. Odoo out-of-the-box software is prepackaged software focused on handling the standard business processes of a specific type of company, or perhaps the specific business processes of an entire industry. Whereas, an Odoo custom solution is a totally unique piece of software, developed to meet a specific, distinct need of a business. When you need a solution to manage standard business processes, Odoo out-of-the-box can be a good fit. Let’s look at some of the benefits of out-of-the-box software. Budget friendly – Odoo out-of-the-box comes right out of “off the shelf” and hence typically has a lower initial price point than custom solutions. Widely available – If your business is one in a common industry (like a restaurant or a retail store), you’ll usually have no problem implementing Odoo out-of-the-box solution and looking at case-studies on how it has successfully helped companies similar to yours. Proven quality and support – Odoo Out-of-the-box software is a proven product and has a large customer base. It comes with the backing of the software company’s quality assurance and support teams. Faster to deploy – Odoo Out-of-the-box is essentially ready to go, aside from installing and configuring it. That means you can start enjoying its benefits quickly. No technical experience required. Because Odoo out-of-the-box has established capabilities, it doesn’t demand a high level of technical expertise. While you may have the capacity to make some adjustments to it, you won’t need an advanced technical team to build it out. Odoo out-of-the-box offers a proven, cost-effective way to help businesses manage standard operations and automate their workflows, but there are some downsides. Functionality gaps. As mentioned earlier, Odoo out-of-the-box software typically serves a large customer base, so its functionality has to be more generic to meet the needs of the mass market. If your business utilizes some unique processes, Odoo out-of-the-box may be missing some features that are important to your workflows, and it may include a slew of features you will never use. But because it’s packaged software, what you see is what you get. Licensing fees. Although the initial cost for Odoo out-of-the-box solution may be lower than a custom solution, it typically includes an annual licensing fee and could require additional fees for upgrades and support. Or you may find you’re required to pay full licensing fees for a large number of users who only need a limited amount of functionality. When you calculate the annual cost, you might discover that Odoo out-of-the-box solution is much more expensive than you originally thought. When Odoo out-of-the-box falls short, a custom solution may be just what you’re looking for. Off the start, you may be intimidated by the thought of Odoo custom software. Perhaps you’ve heard that it’s really expensive, not to mention temperamental and easily broken. But the reality is, not all Odoo customization doesn’t have to be that way. Custom code or modifying source code. A solution made of a bunch of custom code written directly into out-of-the-box software is very sensitive and difficult to maintain. Upgrades or changes to the packaged software will often override the customization, meaning it will need to be rebuilt again and again. And the custom component is not maintained by the packaged software’s provider, meaning it’s on you to fix any problems. Overbuilding. Once you’re in the world of custom, it can be tempting to create a custom component for every feature, even if it could be handled just as well, or even better, by a less expensive out-of-the-box solution. This leads to unnecessarily complex systems that are difficult to use and expensive to maintain. Any right Odoo customization service provider will know about the above mentioned challenges and take a development approach that avoids them. Pairing the correct development process with a team of experienced, professional project managers is critical in all custom projects. Today’s technology also makes these pitfalls easier to avoid. Modern products and solutions utilize APIs (Application Programming Interface) to weave solutions together without putting future upgrades at risk. Today’s developers take advantage of APIs to create stable customizations, enhancements and integrations without changing the code of any packaged software that may be included. With this in mind, let’s talk about the benefits of a properly developed Odoo Customization. Cost effective for the long term – While you might pay more for Odoo customization up front, in the long run, you could save money by avoiding the ongoing licensing fees usually tied to Odoo out-of-the-box. If you have a combination of out-of-the-box and custom software, you might still eliminate some licensing fees if you can limit the number of users in the packaged software.Also, because it’s built specifically for your business, Odoo ERP customization is a long-term solution that won’t have to be replaced in a few years, something you may have to consider with out-of-the-box software. Evolution your way – Rather than waiting for Odoo out-of-the-box’s next release that might (or might not) give you the functionality you want, you call the shots with Odoo customization. When you need enhancements, you can work directly with the developer to get what you want sooner rather than later. Enhanced productivity – Because it has been specifically designed for your organization and processes, Odoo customization can dramatically improve workflows, increase accuracy and enable your team to interact more efficiently with vendors and contractors. Training that fits – Just like packaged software must work for the mass market, so must its training materials. This means training programs for out-of-the-box solutions can be very general and not relevant to your business. Not so with Odoo customization. Just as the software gets customized for your business and processes, so is the training program. Also, when a solution is built for your business, the total amount of training hours required can go down. An edge over the competition – By giving your business capabilities your competitors don’t have, Odoo customization can make you stand out. When software enables you to enhance the customer experience and deliver more value than your competition, it puts you in a better position for gaining market share and boosting sales. As you can see, there are benefits to both Odoo customization and out-of-the-box solutions, which is why so many businesses are taking advantage of both options. By merging out-of-the-box and Odoo customization chances are that you can build an adaptable, cost-effective solution that meets all of your needs and can evolve with you as your business grows and changes. Here are some ways custom and out-of-the-box solutions can work together to benefit your business. You may feel that Odoo out-of-the-box covers most of your needs, but it might be really useful to you if it included a certain field or screen or a custom dashboard to look at a specific report. Here, Odoo customization would be able to give you those missing pieces. Maybe you have a great HR/payroll solution or an awesome accounting solution installed in your organization, but it would improve productivity and efficiency if they talked to one another. Today’s software providers typically make APIs for their applications available to third-party developers so they can write custom integrations between programs. This means you can link virtually any software program to another. Hence, the beauty of Odoo customization. Maybe you have a robust expense management solution, but wouldn’t be helpful to have an app that allows employees to photograph receipts and upload them into the program directly from their mobile phones. Odoo customization can be done using code specifically for this purpose and integrated to the expense management software using standard APIs. It’s important to note that when business challenges are unique to a company, no out-of-the-box solution will likely exist to solve them. If you have a highly specialized business or utilize very distinct processes, you may be in need of a completely custom solution. Odoo customization can help businesses overcome even the most overwhelming obstacles. Just be wary of overbuilding—get Odoo customization done to handle your unique processes, but also make it a point to integrate it to out-of-the-box solutions for standard business functions, like accounting. While there are pros and cons to both the solutions, the decision should be taken based on your business requirements. Here’s our take on making the correct decision. Make a checklist to compare both solutions. Here are a few questions to ask yourself before deciding on the final one. Do I need a high level of customization for my solution? – Can either of the software integrate with our current APIs? – Which solution fits our budget? – Which solutions are our competitors using and how can we outperform them? – How can we find a good software developer? Here’s a list to make your life easier. An out of the box (OOTB) solution is an ‘off-the-shelf’ solution catered to a business’ general needs. A custom software is catered to businesses which require a high level of customization for their processes. OOTB solutions are cheaper and quicker to implement with high availability and technical support. OOTB solutions lack customization and integration. Custom software is unique and customizable with seamless API integrations capabilities. A custom software may cost more and take a longer time to implement as compared to OOTB. It is absolutely fine to customize a software. In fact, no software product today is going to meet the needs of an organization 100%. You can choose to either modify your business practices to align with the functionality of the software or you can choose to enhance the solution to better align with your needs. The correct approach to take depends on the situation. You will need to weigh the cost of ownership against ease of use, user adoption and ROI. Piecing together the best solution with the right out-of-the-box and custom elements may seem like an overwhelming task. Pragmatic Techsoft is here to help you make an informed decision by consulting with you to understand your needs and expectations and explaining the pros and cons of all viable options. You can rely on us to listen to your struggles, understand what you want to accomplish, guide you in your decision-making, and deliver a solution that will propel you toward your goals. Contact us today to learn more about how we can help drive your business success. Get in touch with us at sales@pragtech.co.in to know more. Odoo eCommerce: Create High-quality eCommerce Website from Scratch Why Should Customer go for Odoo ERP Software?